While some may want a time machine to witness seminal moments in history, I just want to go back a month ago. It was a simpler time back then, a younger Michael Milton went to begin teaching a unit that would lead his class to the American War for Independence. And I want very much to travel back to stop him. It’s not that my unit went off track. I’m proud of the fact that I added in a lesson that discussed ways in which enslaved workers protested – which included looking at the Dunmore Proclamation where enslaved workers in Virginia could fight with the British military in exchange for their freedom (which is referenced in the last of the grievances listed in the Declaration of Independence). It’s that I think I know how to make the unit better. And in doing so, I would make one of the most important pieces of our history as the centerpiece. As I have begun to mentor an aspiring educator, I’ve been thinking about my various roles as a teacher. At any given moment I am a mentor, a guide, a sources of knowledge, a hero, a villain, a supporting player, a taskmaster, and a cheerleader. I am an ever-shifting presence in the lives of my students until I become a memory. In addition to my metaphorical hats, I also have many physical hats that I don to embody different historical characters. I play Napoleon, Charles Knight (author of The Working-Man’s Companion), Otto von Bismarck, and a variety of generic roles from different periods of history. I often find myself on Amazon thinking, “seriously, how have I lived 35 years without owning a Victorian era top hat?” As a teacher, you try many ways to make learning more engaging and the smattering of characters is simply one of those ways. Could I use this as an assignment set up in the classroom? The idea delighted me as I imagined myself sending self-destructive assignments to my students. What if it wasn’t me who assigned the students a project but a rather a voice from the past? My favorite tools to prepare students for midterms is not an app or notecards (although both can absolutely be useful) but rather kitchen twine and Gorilla tape. Below is the start to my post for Discovery Education about using Hamilton the Musical in the classroom! Check it out! My name is Alexander Hamilton. For the past four years, I have used Lin-Manual Miranda’s performance at the 2009 White House Poetry Jam to introduce my students to Alexander Hamilton. And every year, they demand a second viewing. Lin-Manual’s ability to tell Hamilton’s story through hip-hop is absolutely amazing and my students often sang the song weeks later. Lin-Manual Miranda is the genius behind Hamilton the Musical, the hit musical that tells the story of the first treasury secretary and of our young nation. When tickets for the production went on sale I immediately bought them. I cannot explain how amazing the show is. Mr. Miranda not only does a remarkable job bringing Alexander Hamilton to life, he breathes life into the founding of our nation. After seeing it, I could not wait to bring it to my class. While Act 1 does an amazing job focusing on Hamilton’s experience during the War of Independence, as a classroom teacher it is the second act that I feel could help illuminate the differences between the Jeffersonians (Democratic-Republicans) and the Hamiltonians (Federalists). Two of the songs in particular, “Cabinet Battle #1” and “Cabinet Battle #2” directly highlight the foundational differences between the beliefs of Alexander Hamilton and Thomas Jefferson. For this lesson, I am going to focus on “Cabinet Battle #1” which focuses on core economic differences between the two secretaries. In this rap battle, President Washington mediates a discussion regarding Hamilton’s economic plan. The lyrics are fast and full of history! As my students would be overwhelmed with this at first, I need to back up and discuss the differences between the two men. My new post for Discovery Education! As a fifth grader during the Gulf War, I distinctly remember Mrs. Spina helping to calm our fears about the war. After giving us a background on the war, Mrs. Spina brought us to a large world map to show us how far away the fighting was from our small town in Massachusetts. I remember going home and feeling more confidant talking about the war with my parents. While I did not fully understand the entire situation, I understood the war a bit better. When I started to watch the news on my own that background proved invaluable as I could follow along with the news anchor. While we all have metrics and curricula to get through, as teachers we must help our students understand the world around them. The unknown is scary. As teachers, we help shine a flashlight on the unknown. We empower students through knowledge. When ISIS attacked Paris on Friday evening, I knew that whatever lesson I had originally planned for Monday was out the window. I spent much of the weekend reading about the attacks, about ISIS, about the Syrian Civil War, and about the refugee crisis. I thought about the lesson from Mrs. Spina and while I could not show them a map about fighting far away to assuage their fears, I could help them understand more about what is going on in Syria. When class began on Monday, my students were very concerned. We began just talking about the bombing in general – both in Paris and Beirut. Listening to them and their concerns helped guide the next few days as I sought out resources to use with them. With this post, I am going to share resources that I have gathered and my final activity for discussing American involvement in the Syrian Civil War. For more, click on the link! As many of you have might have seen on my website, I have been digitally altering movie posters and other images to tell a new historical story. The results are often silly but have been a fun outlet for me personally. 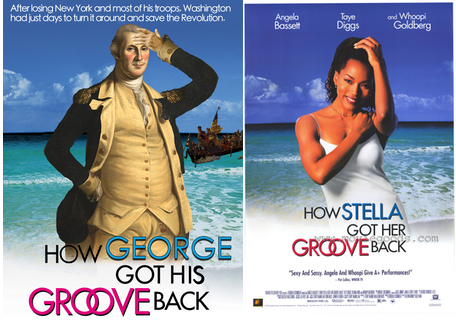 For instance, How George Got His Groove Back popped into my head after researching and then visiting Washington’s Crossing. I simply had to make this when I got back to my hotel that night! I’ve recently begun blogging for Discovery Education! My first assignment was to create a lesson for Veterans Day and I am really excited to share this with you! “My name is Michael K. Milton, and I am a US and World History teacher at Burlington High School in Massachusetts. My classroom is a place where my students and I get to experiment! As students explore history, they reflect, draw connections, inquire, discuss, debate, and seek out more knowledge about the world in which they live. Like my students, I love to learn, question, debate and inquire with my peers. In this, my first blog entry for Discovery Education, I want to share what Veterans Day means to me, and how I incorporate meaningful reflection into my classroom. For the complete article, visit the below link! Teacher Trading Cards: Make Your Own!